Forty-three year old Jeff Winston has a heart attack while talking to his wife on the phone, and dies. He wakes up in his college dorm room at the age of 18. He soon realizes he is going to have to live his life over again, so he decides to make different choices to live a better life this time. He succeeds. But then at 43 years old, he has a heart attack and dies. And he wakes up at the age of 18 again. 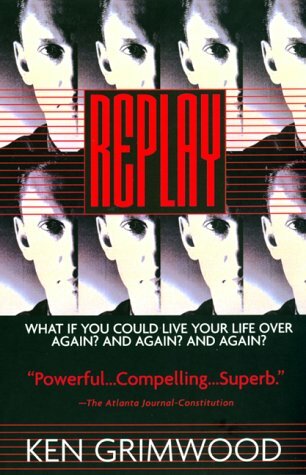 Ken Grimwood's Replay is a gripping story of one man's journey to find happiness in his life. Over and over again, Jeff has to relive his life, and the choices he makes each time are thought-provoking. What would you do differently if you could live your life over again? Grimwood really makes you think. Jeff has many lives throughout the story. Sometimes he focuses on becoming rich. Other times he focuses on finding love. Each time, I was drawn into his life, wanting to see where his choices would take him. This was a book club selection, and most of the women enjoyed it. But there were some complaints about some of his choices, particularly when he chooses to relive the '60s in a drug-induced haze. And there was some discussion about the fact that while the author delved into the lives Jeff lived, there wasn't as much emotion as we would have liked. I personally felt his emotions were shown through his actions each time he relived his life. I could feel his frustration, his happiness, his sadness as each life passed by. Overall, if you like sci-fi, time-traveling novels, I highly recommend this one. This review was written based on a copy of Replay that I purchased. OK, for the 20th time...this is my favorite novel! And you put your finger on what makes this book so great - it is thought-provoking. I love books that make me think, especially books that make me think about my own life and choices. Some in my book group also complained about the "replay" where he basically wastes his life and immerses himself in drugs, etc. But I thought they missed the point...and indeed, the emotional core...he did that because he was so completely in despair over the loss of his daughter. He figured that the only way to deal with that pain - and to avoid it again in the future - was to insulate himself from any meaningful relationships. So glad you had a chance to not only read this wonderful novel but also discuss it - this book just begs to be discussed!